Fluoride is a chemical that is added to many municipal water supplies to help aid in dental health. While fluoride can help prevent tooth decay, unfortunately it can also contribute to various health risks. Many prefer to remove it from their water – and we’re here to help with that! If you are looking for the best fluoride water filter for your home, keep reading. There are lots of different styles of water filter. Some can remove fluoride, but many cannot. Thus, it’s important to find a fluoride filter that is specifically designed to remove this potentially harmful chemical. 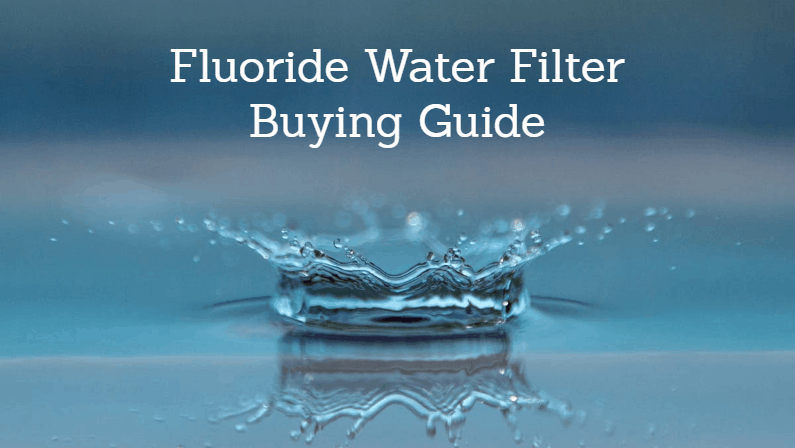 We list the best fluoride water filters in the buyer’s guide below. 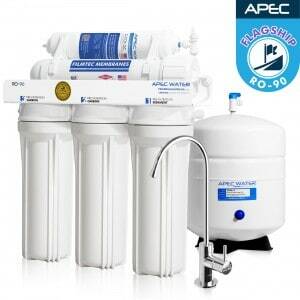 The APEC RO-90 is a reverse osmosis water filtration unit that installs under your kitchen sink. It has a high flow capacity of up to 90 gallons a day. The unit features a 5-stage filtration setup that effectively removes a huge variety of contaminants, including up to 97.7% of fluoride. It also does wonders for the taste of your water. This unit is a best-seller on Amazon, and has nearly flawless ratings in fluoride water filter reviews from customers. It’s made by an American company with an excellent reputation for effective, durable products. Keep in mind that, like most reverse osmosis filters, this unit does require decent water pressure to work properly, and it also may be difficult to install if you don’t have any plumbing knowledge. 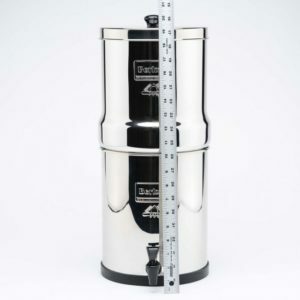 The Big Berkey is a countertop gravity filter. You fill it from the top, and water naturally seeps through the filter into a holding chamber, where it can be poured out into a glass. This makes it portable and easy to use – although you will need to find space for it on your counter. The Big Berkey has a standard filter to remove many contaminants, and an optional PF-2 fluoride and arsenic filter. With this fluoride filter, the unit is able remove up to 99% of fluoride from your drinking water (the typical reduction is around 95%, but depends on water conditions). The water filtration fluoride tech is fueled by activated alumina, which is quite effective and safe. The filter holds 2.25 gallons of water, so it’s good for a mid-sized family. There are larger and smaller units available, but this is the most popular option. For those seeking a countertop unit, this is the best fluoride water filter for the money. Click here to learn more. The AquaGear Water Filter Pitcher is a water pitcher equipped with fluoride filtration technology. It effectively removes lead, fluoride, chlorine, chloramine, chromium and other harmful contaminants. It’s designed to remove up to 2,000% more contaminanants than cheaper Brita filters! This is also one of the few filtered water pitchers that actually removes fluoride. The Aquagear is more expensive than your average water pitcher, but it’s worthwhile. Not only does it remove lead and fluoride (while most pitchers do not), it is also backed by a lifetime warranty. The durable filters are made in the USA and tested to NSF standards, and provide some of the best filtration tech in the industry. Lastly, Aquagear actually supports clean water charities in developing areas to help ensure impoverished people have access to clean drinking water. 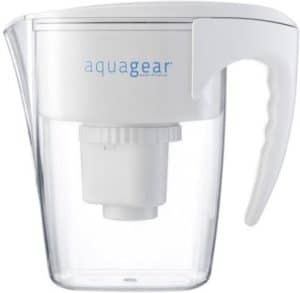 Aquagear is expensive for a water pitcher, but definitely the cheapest option when it comes to fluoride filters. The replacement filters should last for 150 gallons, making the long-term cost reasonable. If you prefer the simplicity of a filtered water pitcher, this is the best fluoride water filter for you. Click here to learn more about the AquaGear. Fluoride is used because it helps protect teeth from cavities and decay. It’s commonly used by dentists, and in small quantities it appears safe for human use. However, the use of fluoride in drinking water is quite controversial, as there are some serious potential health risks associated with long-term exposure to the chemical. The International Academy of Oral Medicine and Toxicology maintains a list of the health risks of fluoride exposure. For one, fluoride was recently identified as causing developmental neurotoxicity in humans. One study found that fluoride exposure in pregnant women actually led to a lower IQ in their children. There are also possible links to cancer, but findings thus far are inconclusive. Beyond that, fluoride has been linked to acne, bone weakness, cognitive deficits, insomnia, lower fertility rates, and a huge range of other health concerns. In short, fluoride is a dangerous chemical that you should absolutely try to avoid. Filtration technology – There are lots of different filter types out there, each with unique pros and cons. We focused on filters that were most effective at removing fluoride specifically, and that also did a good job of reducing other contaminants. Value – While you certainly don’t want to skimp out, you also probably don’t want to spend a fortune! The good news is that you can get water filtration fluoride technology at a very reasonable price, and we focused on models that offered excellent value for your hard-earned money. Reviews – To round out our own research and testing, we looked at third-party fluoride water filter reviews to gather more data. This allowed us to see what real customers thought of each model, and how well it worked for a wide variety of water qualities. Durability – We picked models that were well designed, well made and durable. This applied to both the filtration unit itself as well as the removable filters.